Bhagavad Gita was addressed by the Lord Sri Krishna to Arjuna, symbolising the entire human race as to the right action, proper direction, the value system and all the humanity cherishes for world peace and prosperity. This is the relevance of Gita for today's world torn apart under the powerful divisive forces of lust, anger, greed, egoism, infatuation and jealousy at all levels from individual to nations. 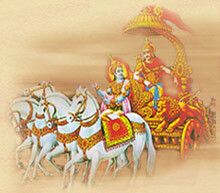 Bhagavad Gita is the advice and prescription for achieving world peace and prosperity. This Indian Classic has been modified to suit the modern technology of CD-ROM in providing a wide variety of interactive features. It not only deals with questions at a basic level but simultaneously addresses an audience looking for higher levels of learning. It seeks to promote the cause of Sanskrit, Indian Culture and heritage for a global audience and particularly in imparting the values of an age old culture which has been overtaken by hybridisation and pop culture.